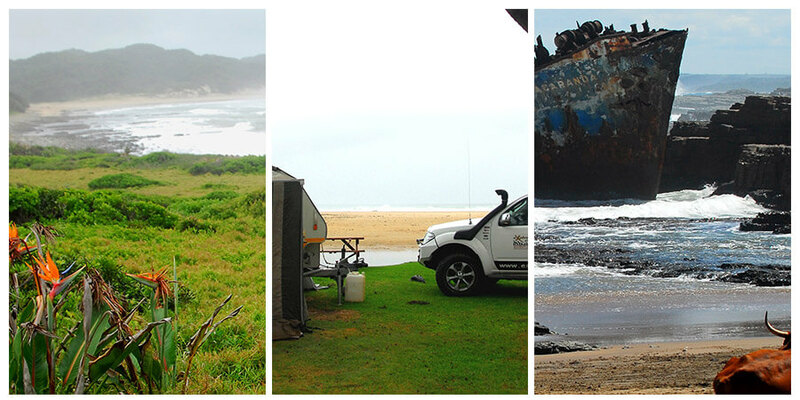 Having done photographic 4X4 safaris and hikes between Msikaba in the northern part of theWild Coast and Dwesa Game Reserve, we decided to go and explore the southern part of the adventurous and ruggedly beautiful Wild Coast, where one can follow in the footsteps of the shipwreck survivors. Our adventure started at the Mazeppa Bay Hotel which was taken over by its current owners in 1995.The hotel itself was in a state of disrepair and much love and hard work was put into the hotel to make it what it is today. Mazeppa Bay derives its name from the ship, the Mazeppa. The ship was captained by a CJ Cato, on its way to Delagoa Bay from Port Natal in 1842. The Mazeppa was in search of a British man-of war to rescue the Garrison, which had been besieged by the Boers. The captain steered the ship into what is now known as Mazeppa Bay for shelter and ran aground. Legend has it that its ruins are buried under the sand dunes at Mazeppa Bay. 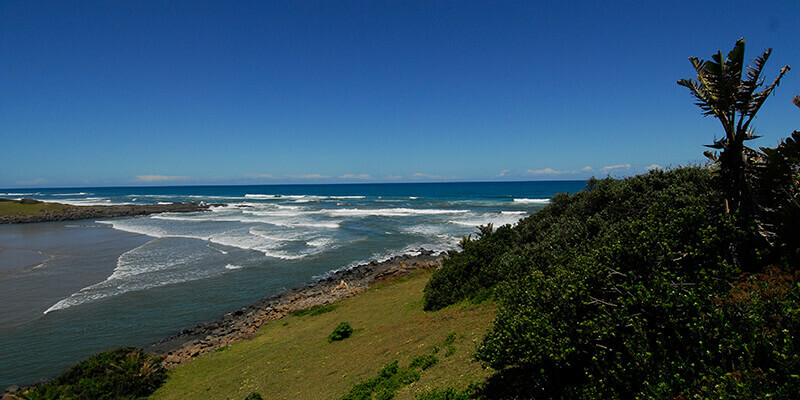 Mazeppa Bay is one of the most beautiful parts of the Wild Coast and is particularly famous for its fishing. There is a big variety of game fish to be caught at Mazeppa and the biggest ever caught was a 791 kg Great White.The Bay is characterized by its own Island. Depending on the tide, this is sometimes only accessible by a quaint suspension bridge, which joins the Island to the main beach. After a night of a revived rest, we started our journey to Morgan Bay by driving through the most beautiful Manubi Forest with its distinctive Yellowwood and Sneezewood trees. 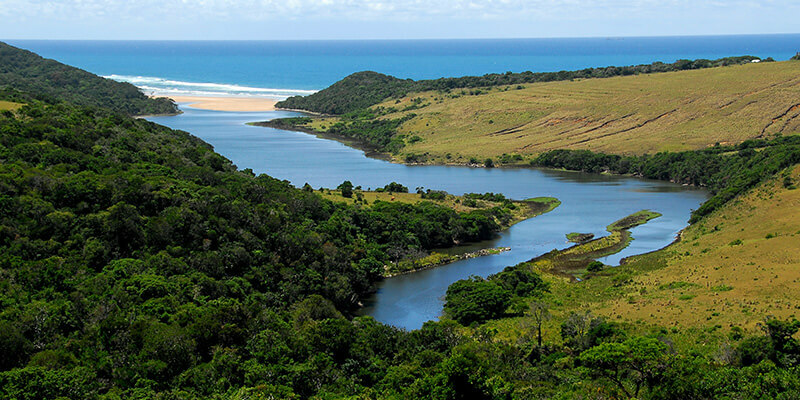 The Wild Coast has many rivers and deep ravines with few bridges near the ocean so one has to drive in and out to get to points along the coast, so what may be a few kilometres walk along the beach from one spot to another entails fairly long drives over very rough roads…… all part of the fun. There are numerous beautiful river mouths and we did some challenging river crossings through rivers by the names of Ngqwara, Gqunqe, Cebe, Qolora, Ngogwane and the Gxara River. Its areas like this that only permit holders and residents are allowed to enter. 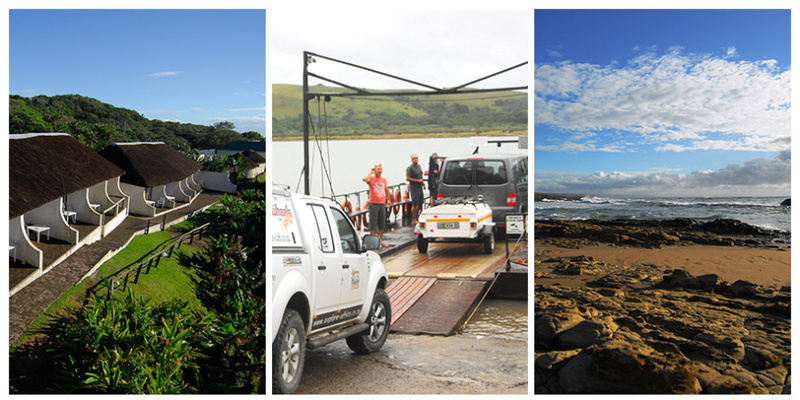 Permits are issued by Eastern Cape Tourism in East London and had to be arrange beforehand. An area 1km from the beach is considered protected and no new developments are allowed, hence an even wilder look to the Wild Coast than its topography. Although the 4×4 trekking was part of the tour and fun, the main attraction was the scenery, with hills and rivers, bush, and farmlands in every direction. These rural areas of the Transkei Wild Coast have very poor infrastructure so what passes as roads between villages are really just Jeep tracks which are extremely slippery and muddy after rain. The vast majority of land is uncultivated, un-irrigated, and for the most part unfenced. Our route took us past Wavecrest and the Wavecrest Beach Hotel which is situated on a pristine, mangrove-lined estuary, surrounded by magnificent dune forests and endless expanses of beach. The next point of interest on our journey was a visit to the Jacaranda ship wreck. The road down to the wreck was very confusing, even with our GPS, with multiple sandy tracks in several directions. Finally our efforts paid off as we arrived at the little beachnear the Qolora river mouth where the Jacaranda wreck lies in rusty bits and pieces up against the rocks. During a sunny day, on 18 September 1971, The Jacaranda, a 2,000 ton, Greek-owned coaster, tragically ran aground due to strong winds. The ship carried 15 crew members, which included the captain’s wife – and all survived the incident. It is believed that the vessel suffered engine trouble according to the captain (Captain Kokkios), The Jacaranda was not carrying cargo on the night she ran aground – this is thought to be the reason for her riding high on the water. The ship was caught by strong winds and although the crew dropped two anchors in an effort to stabilize the ship, the anchors refused to stay down, and dragged along the sandy ocean floor, causing the ship to head into the rocks. 42 Years of lying at the mercy of the sea has rendered this vessel to a mere resemblance of a sea faring ship. Ironically the name and its surrounding paintwork seem to have held out against all odds. Cows on the Wild Coast beaches are a common sighting. Whereas the cows may be enjoying the green grass on the beach and fresh rain water in the rock pools, the real reason for them to come down to the ocean is to find natural salt licks as the herders do not put out salt licks for their animals. Quite close to the end of our trail we came upon the very interesting and historical Nongqawuse’s pool in the Gxara River. 1856 was a bad year for the Xhosa nation of the Wild Coast. Their lands had been taken by the British, drought had withered their crops, and their prized cattle were dwindling under a mysterious disease. The people were facing a hard winter when hope came in the shape of a young girl called Nongqawuse, the niece of a prophet. Nongqawuse claimed that the spirits of the ancestors had spoken to her from a pool in the Gxara River. If the people would only kill all their cattle and burn their crops, a day would come when new cattle and crops would arise along with an army of the ancestors who would drive the whites into the sea. The “vision” took hold among the desperate people, who followed her orders. By February 1957 more than 200 000 cattle had been slaughtered and left to rot. All the summer crops had been burnt. The allotted day dawned and nothing happened. The weakened population began to starve and within a few months more than a third of the entire Xhosa people had died of starvation and disease. It was easy for the British to take over the remnants of the tattered Xhosa kingdom and imprison the chiefs. Nongqawuse was taken to Robben Island for her own safety but her people were broken. After a long and exhausting but very interesting day we reached the Kei River. 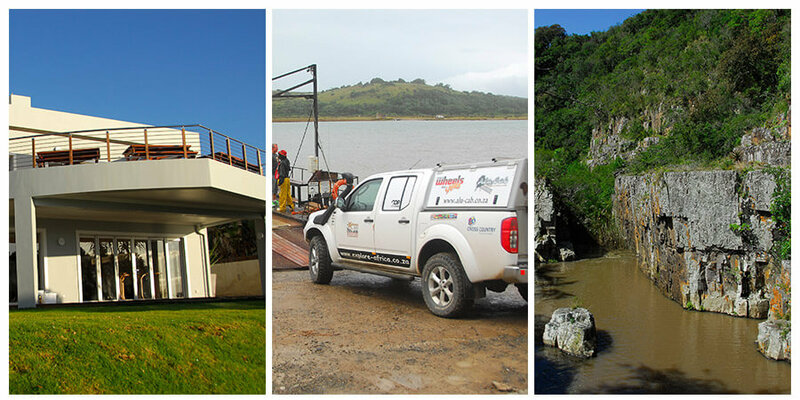 The Kei Mouth pontoon is one of South Africa’s two remaining car-transporting pontoon river ferry services, providing visitors with an unforgettable experience 365 days a year, closing only when the river is in flood or the seas too large. The skipper has been operating the pontoon for many years and seemed quite happy in his work. There are bridges further inland, but this saves one from a longer drive, and of course it’s all part of the adventure. It cost R100 for a car plus a trailer. Our route ended in the peaceful seaside holiday village of Morgan Baywhich is located less than an hour from East London. We sat up camp on the Inchara Lagoon’s edge under shady trees with the beautiful beaches just a short walk away. All sites have electricity, picnic benches and braai facilities, and are in close proximity to the separate ladies and men’s ablutions. Coin operated washing machines and tumble dryers are also available. Morgan Bay is definitely a destination where one can spend more than a couple of days. During the day you can gaze at passing ships on the horizon, relax on the beach with a book, play a round of golf in Kei Mouth, or take a walk along the beach and picturesque cliffs. 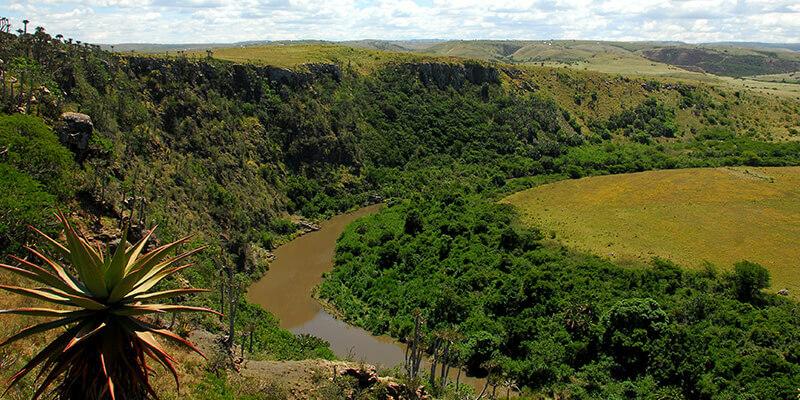 There are several good fishing spots in the area and ski-boats can be launched from the mouth of the nearby Kei River. The more adventurous may enjoy a canter along the Morgan’s Bay beach with Mkulu Kei Horse Trails, or a game drive at Endalweni Private Game Reserve, while those in need of some pampering can enjoy spa treatments at the Morgan Bay Hotel. Slightly further afield and only a short drive over the cliffs from Morgan’s Bay, takes you to the Double Mouth Nature Reserve and the ever popular Bead Beach (Treasure Beach), site of a 16th century Portuguese shipwreck, where Carnelian Beads, Money Cowries and shards of broken Ming Porcelain lie scattered amongst the shells.